The relaxing resort by the carbonated sea. 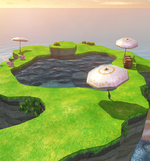 The Seaside Kingdom is a beach kingdom that appears in Super Mario Odyssey, being either the ninth or tenth kingdom visited, depending on whether the player chooses to go here or to the Snow Kingdom after leaving the Metro Kingdom. It is the greater location of Bubblaine, a cliffside beach resort area. Due to the local inhabitants being beret-clad snails, the boss having a French name, and two of the missions having a French title, the location may have been partially or fully inspired by France, most likely the Côte d'Azur, also known as the French Riviera. When Mario first arrives, Mollusque-Lanceur is sitting on top of the Glass Tower drinking all of the Sparkle Water, and the fountains are corked. To restore peace to the kingdom, Mario must uncork the fountains and defeat Mollusque-Lanceur. It is daytime during Mollusque-Lanceur's attack on the kingdom. Once he is defeated, the time of day changes to dusk for the rest of the game. Bubblaine was conceived as an elegant resort following the basic theme of golden champagne. According to the concept art, a blue-colored Dorrie not wearing any hat nor goggles was supposed to be found swimming there. The Glass Tower shines in the setting sun. The spectacle known as Glass Tower isn't just majestic, it also fulfills the critical role of manufacturing the famous local product Sparkle Water. It stands atop the Glass Palace, which has a uniquely beautiful architectural style. It's a treasure to be explored! Behold, the power of carbonation! The four fountains in Bubblaine spray seawater toward the Glass Tower. The ocean here is carbonated but otherwise unremarkable. However, when blended in the Glass Tower, it takes on a deep, elegant flavor and becomes Sparkle Water! This treasured beverage is said to bring good fortune, happiness, and even romance to those who drink it, which has led to it being featured in many wedding ceremonies. They look even bigger in person. In addition to the fun resort spots found in Bubblaine, there are some notable dangerous locations as well. One of these is the underwater cave connected to the lighthouse where gigantic creatures called Maw-Rays make their nests and shoot out their long bodies in response to stimuli. A little caution can go a long way when exploring this place. Deep enough for a full-body soak. A ways away from the beach sits an outdoor bath fed by a natural hot spring. Featuring full ocean views, it has become quite popular with tourists. This spring was formed by volcanic activity on the ocean floor, and it's said to have numerous medicinal effects. Take one dip, and we're sure you'll fall for its charms. It's also a lovely natural reprieve from the modern resort developments. The tan of a true beach-volleyball enthusiast. When in Bubblaine, be sure to enjoy a game of beach volleyball on the local court. The on-site coach gives strong guidance, even for beginners. As they say around here, "Let's play!" These unusual creatures collect seawater constantly. They use this water both to defend themselves and to propel themselves, sometimes straight up! Gasp at the sight of all four fountains spraying into the Glass Tower. Refresh yourself with the fizzy delights of Bubblainian seawater. Play in the action-packed Beach Volleyball tournaments. Flooded Cave Red door Underwater in a small trench north of the Lighthouse A small, flooded room with a creature moving around in the sand, which Mario must stun with Cappy and ground pound to reveal a Power Moon. Sphynx's Underwater Vault Sphynx At the bottom of the kingdom's northernmost ocean trench A small, flooded treasure vault with a single treasure chest containing a Power Moon. Mario can only access this room after answering the Sphynx's question correctly. Rumbling Floor Cave Warp Pipe In front of the Odyssey A small cave where the player must locate a Power Moon by feeling a vibration from the floor through the controller. Beach House Locked door guarded by a Bubblainian In front of the Beach House Checkpoint Flag A small room filled with Bubblainians where Mario performs a hula dance on the stage to earn a Power Moon. Mario can only enter this room while wearing the Resort Hat and Outfit or Sunshine Shades and Outfit. 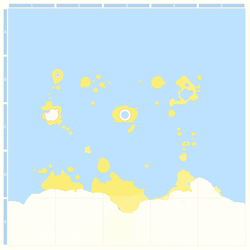 The Cloud Sea Mini Rocket On a higher platform before the Beach House A platforming area surrounded by a sea of clouds which Mario must clear by activating Pulse Beams while avoiding their rings. Many Burrbos are also found in this area. The Narrow Valley Red door In an alcove past the Beach Volleyball minigame A narrow, canyon-like area where Mario must capture a Gushen to navigate the canyon while avoiding the pits and poison. Small pools of water are present throughout to help Mario replenish the Gushen's water supply. The door leading to this area can only be reached as a Gushen. The Sinking Island Red door Underwater below the small bridge on Hot Spring Island A grassy area surrounded by a sea of lava, where Mario must capture an Uproot and use it to reach the top before it sinks into the lava while avoiding the Moonsnakes throughout the area. Pokio Valley Moon Pipe Underwater north of Rolling Canyon near the on-land Komboos A small, valley-like area where Mario must capture a Pokio and use its beak to knock bombs at the blocks in the center, opening a cage containing a Power Moon. Burrbos also appear in this area. The Spinning Maze Moon Pipe Underwater northwest of the Lighthouse A maze-like area featuring rotating doors, lifts, and Moon Shards Mario must collect to obtain a Power Moon, as well as Spinies scattered throughout the maze. The Glass Is Half Empty! : The goal is to uncork all four of the Sparkle Water fountains. The Glass Is Half Full! : The goal is to defeat Mollusque-Lanceur. There are two paintings in this kingdom. 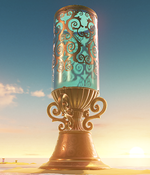 One is located at the bottom of the Glass Tower's inside, next to a ring of coins and some air bubbles. It takes the player either to the Iron Cage at the Wooded Kingdom, the Island in the Sky at the Cascade Kingdom or the Viewing Balcony at the Lake Kingdom, and it can be accessed after defeating Mollusque-Lanceur. The other painting is located on the Diving Platform, which can only be accessed from a painting at Bowser's Kingdom or the Mushroom Kingdom. The Seaside Kingdom has purple Power Moons. There are a total of 73 Power Moons (70 regular Power Moons and 1 Multi Moon) in this kingdom. During the player's first visit to this kingdom, they can collect 48 Power Moons and the Multi Moon, including one from the kingdom's Hint Art. The player can also collect a Power Moon if they travel to this kingdom using a painting found in a future kingdom (either the Mushroom Kingdom or Bowser's Kingdom). After the player defeats Bowser in the Moon Kingdom, 2 more Power Moons become available to collect. The Moon Rock will also be available to destroy, causing 19 additional Power Moons to be accessible. 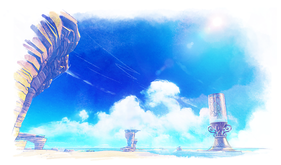 In order to progress to the next kingdom, the player must collect at least 10 Power Moons. There are a total of 100 regional coins, which take the form of shells, to be found in the Seaside Kingdom: 6 coins in the starting area, 18 near Rolling Canyon, 15 near Beach House, 16 near Glass Palace, 15 near Hot Spring Island, 6 near Ocean Trench East, 3 near Ocean Trench West, 18 near Lighthouse, and 3 Above Rolling Canyon. A yellow Crazy Cap Dorrie. National coins can be spent here. A purple Crazy Cap Dorrie. Regional coins can be spent here. Umi no Kuni Sea Land; same as Water Land. Shūwǎshūwǎnà Transliteration of the Japanese name. This is the only kingdom whose Koopa Freerunning does not start from where Mario talks to the Koopa Troopa for entering the race. After the Multi Moon is collected, the Sun is seen setting in the north instead of in the west. According to Pauline's quiz, Pauline had already been to Seaside Kingdom prior to encountering Mario and giving the quiz. ↑ Post about the concept art of Bubblaine by the Official Japanese Super Mario Odyssey Twitter account. Retrieved July 23, 2018. This page was last edited on February 26, 2019, at 13:26.